You use Fitbit to measure your fitness goals. Hours are spent pouring over stats about the number of steps you’ve taken and the calories you’ve burned. You are motivated, engaged, and having fun as you progress. You are taking care of your body…but what about your mind? Studies show that reading creates mental stimulation, reduces stress, expands vocabulary, improves memory and analytical thinking skills, enhances focus and concentration, and even increases tranquility. 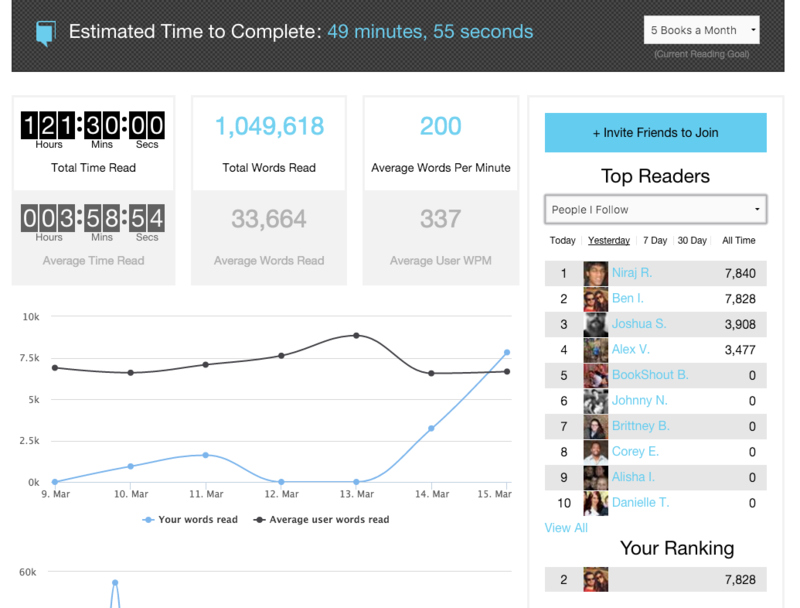 And yet, there hasn't been a technology to help boost and track your reading goals…until now. Gamification is using game mechanics to increase engagement and to entice our natural competitive behavior. On the Fitbit platform, the most basic measurement is a single step. On BookShout, the foundation of the our entire gamification system is a single word. We ask you a basic question. How many books do you want to read this month? As an example, let’s assume you want to read 5 books this month. Since the average book is about 60K words, we do some number crunching and give you your daily reading goal of 10K words a day. Now all you have to do is what readers love — read! 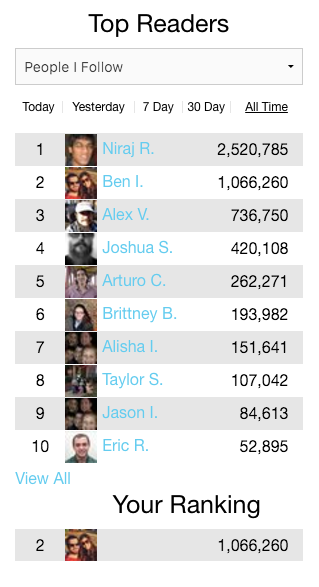 You can take a deeper dive to see how much your friends are reading and your rank among them. Filter by time increments to see your stats for yesterday, the last seven days, the last 30 days, and all time. If you join using Facebook, you will automatically follow your Facebook friends on the BookShout platform. If you’re aiming for the top spot on BookShout, you’d better put your feet up and the get the coffee pot going. Yesterday’s top reader consumed nearly 109K words, an impressive feat since, as you may recall, the average book is 60K words. Looking to chase down BookShout’s all time reader, Trudy? I’d advise you use our speed reader and clear your schedule! 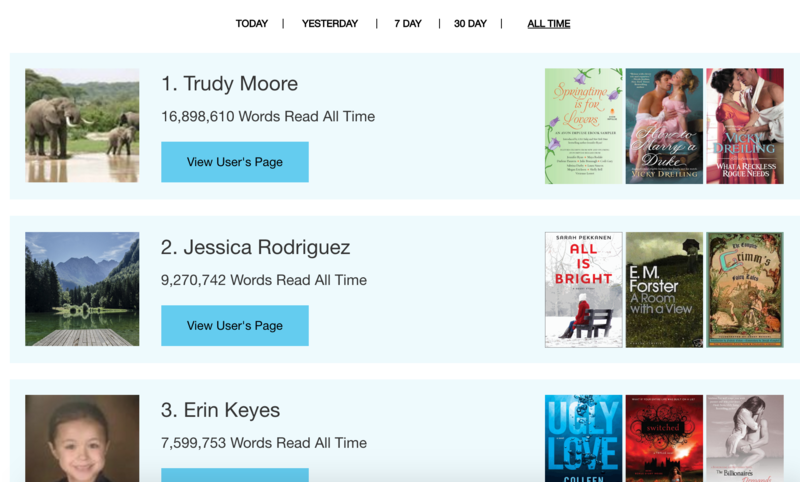 Trudy, a legend in our office, just passed 15.5 million words read, which is about 42K words every day for a year! Although we’re excited about what we’ve built, this is only our first step. The gamification of reading opens up many opportunities. Teachers using this technology will be able to both obtain and verify daily data on their students’ reading habits. Companies who are passionate about ongoing education could receive analytics on employees who participate in their reading programs. Parents will be able to monitor what and how much their children are reading. Do you believe in the old saying, “What gets measured gets done?” How many books do you want to read this month? Join the BookShout community, set your reading goal, and let us help you measure success.